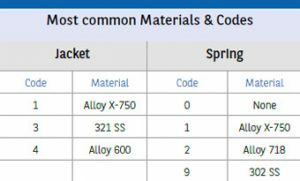 Select the proper cross section or axial section (AS) in the table, then select the material code “M or H” based on the desired wall thickness. The first digit designates the O-Ring material, the second the spring material, in case an OSI-type is selected. 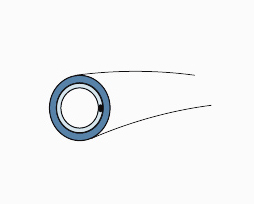 Non-vented rings (OI & OE) are designed for lower pressure ranges. The perfectly closed O Ring design avoids ingress of the media into the seal. Moderate load, moderate pressure capability. The first digit designates the O-Ring material, the second the spring material, in case an OSE-type is selected. Designed for lower pressure ranges. The perfectly closed O Ring design avoids ingress of the media into the seal. Moderate load, moderate pressure capability.